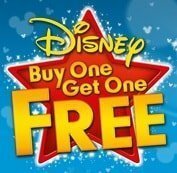 Disney’s amazing Buy One Get One Free offer is back. From the 12th March to the 15th April buy selected Disney DVDs and Blu-rays and get another absolutely free. There are over 30 films to choose from including Pirates of the Caribbean: On Stranger Tides, The Lion King and Cars 2.